I made you a Christmas avatar, but since you did not pick it up (or post since then, I think) ...I was afraid you had left us and did not make you a Valentine avatar! But I'll make you one tonight and post it here. I am glad to see you are back with us! Then I gave you a box of chocolates, a long-stemmed rose in a vase, a red bow for your lovely fur-hair, and a sparkly Happy Valentine's Day emblem. Click on Profile at the top of this page, then go to "Forum Profile Information" on the left ... then under Picture, click the THIRD radio button: "I will upload my own picture" option. DELETE the "http://" in the box, then add your URL. Then scroll down to the bottom and click the "Change profile" button. And, voila! Your avatar is updated. I thought I'd better come down from the rafters and get myself dressed for today and tomorrow's court festivities. Thank you so much, Brandi for all of the beauties to choose from. You are so talented and thoughtful. I am happy you found yourself here. I finished St. Patrick's Day avatars and am working on Easter now. I just made your Easter one today! Just wondering if you have any desire to create a St. Patrick's avatar for me (Irish is big in my household). Snoopy would be really cute holding a big shamrock or with little shamrocks flying around. You won't hurt my feelings if you're not doing them for St. Patrick's. I'll post St. Patrick's Day avatars right around Valentine's Day so everyone will be able to make a timely switch-over! You're the BEST!! Thank you!! No chasing of critters this Valentine's Day! The one on the treadmill was just something I thought of one night and wanted to see if I could make it happen. I am so glad you have enjoyed using it! You know, you can use it anytime you want! Oh Brandi,these are so cool. Thank you! 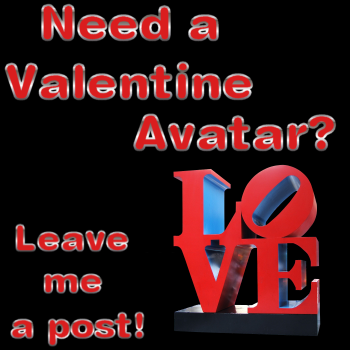 I noticed that you are using an image I made for your facebook page as an avatar. It is not the right size for an avatar here on SM, so it lost its animation and its clarity when the SM software re-sized it. So I redid that one you are using to work here and also made a background for you if you would like to use it as well. P.S. Your St. Patrick's design has him in another outfit, but I just made Easter for you and put you back in the same outfit. I think you'll be pleased. Thank you Brandi, I have been the care giver for 3 years most of the time 24/7 so he and I both were very attached..she got sick and died within a week so there was no suffering and that part makes me happy, my baby even slept in the bed with her half the night and then he would sleep with me the other half...how giving our animals are to the ones that love them. I love the picture of your baby...I must say she does not look her age, very beautiful . Thank you for fixing my avi I will swap it out...my grands get a kick out of seeing him on facebook...again thank you for the time you spend dressing all us monkeys. I am just glad you found the post and I could help out. I know you will take extra time with your furbaby and be able to comfort each other in a small way. My condolences again to you. I think I miss making your daily snowman avatars! I wouldn't forget you, Irish! I also have St. Patrick's Day and Easter done for you!